The United Kingdom’s Ambassador to the Netherlands Peter Wilson CMG hosted the event and, in the course of his welcome, drew the attention of the guests to the long history of close relationships between individuals from the two countries. 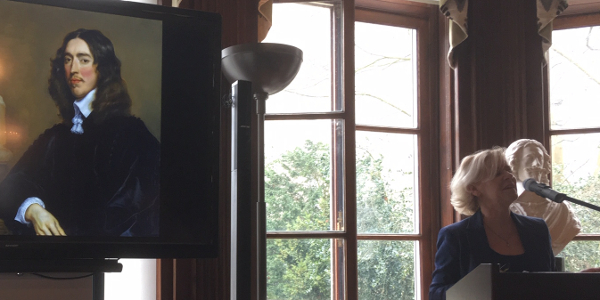 In her role as the project’s director, Dr Ineke Huysman explained the purpose, the background, and the ambitions of the Johan de Witt Project, as well as the focus for the first instalment of metadata in EMLO on De Witt’s incoming diplomatic correspondence. A further three talks highlighted the roles of the project’s partner institutions: Professor Lex Heerma van Voss, director of the Huygens ING, discussed the reasons why early print editions tend to be partial and all too frequently include neither complete texts nor a full listing of the surviving letters; Professor Charles Jeurgens of the University of Amsterdam and the National Archives of the Netherlands (Nationaal Archief) explained the tendency for historic library catalogues not to provide descriptions at the level of the individual letter and how digital work is beginning to unlock what may be described as the ‘black boxes’ of the archive; and I spoke about Early Modern Letters Online, Networking Archives, and the ongoing international work of Cultures of Knowledge, which — as the correspondence of many of the individuals under investigation currently demonstrates — promotes pan-European scholarly and technical collaboration through our own times of uncertainty. Emeritus Professor Jonathan Israel from Princeton University (the author of the indispensable The Dutch Republic: Its Rise, Greatness and Fall, 1477–1806) placed Johan de Witt in context, describing both the significance of the Grand Pensionary and Anglo-Dutch relations in the early modern period.2 He spoke in detail of the admiration the English diplomat William Temple (1628–1699) held for De Witt, and observed how Herbert Rowen, whose work he confessed to have exerted a crucial role early in his own career, would have welcomed and benefitted from such an invaluable digital initiative.3 The formal part of the celebrations concluded with a presentation in which the Ambassador handed the first copy of Johan de Witt en Engeland to the Algemeen Rijkarchivaris (General State Archivist) Dr Marens Englehard. 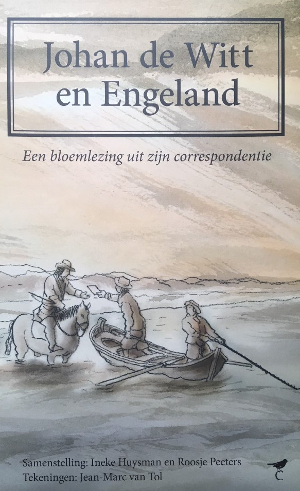 This beautifully produced and unique publication draws on twenty letters from De Witt’s correspondence, all with an English connection, through which the imaginative and creative illustrations by project member Jean-Marc van Tol have been threaded seamlessly, each one inspired by an early modern painting or print. The letters selected range from those written in the 1640s, a period when England was in turmoil prior to the execution of Charles I and when Johan and his brother Cornelius visited the country on a leg of their European travels, to May 1672, just two months before the murder of the De Witt brothers. Publication of this anthology, together with the release of the first instalment of metadata in EMLO, is testimony to the hard work of the team of volunteer contributors who dedicate so much in terms of time and commitment to the project. Dr Ineke Huysman presenting the Johan de Witt correspondence project in The Hague (with Charles I looking on from the side! ), 14 March 2019. As Cultures of Knowledge continues its work with clusters of correspondence and their underlying networks, interesting overlaps between the Johan de Witt project and the Networking Archives project, which is centred around the letters to be found in the Tudor and Stuart state papers, are certain to emerge. Even at this early stage, manuscript versions of the same letter preserved in both The National Archives at Kew and the Dutch National Archive have come to light, and the ability (through EMLO) to link manifestation versions of a letter is a prospect the partners relish. As EMLO, the De Witt project, the National Archives of the Netherlands, and the Huygens ING step forward together, sharing knowledge and sharing platforms, the spotlight seems set to draw into focus early modern networks that have relevance for aspects of our own lives and our situations today. This entry was posted in Uncategorized on March 17, 2019 by Miranda Lewis.